The US says 45 nations have joined Bush's "coalition of the willing"
The United States says American forces will enter Iraq to search for weapons of mass destruction even if President Saddam Hussein complies with an ultimatum to leave. 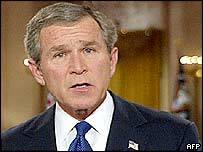 President George W Bush's spokesman Ari Fleischer said that allied troops would go into the country "no matter what", but warned the Iraqi leader that if he did not leave it would be his "final mistake". Saddam Hussein, has flatly rejected Mr Bush's ultimatum to go into exile within 48 hours or face war. A statement from a cabinet meeting chaired by the Iraqi president said Iraq and all its people were "fully ready to confront the invading aggressors and repel them". US Secretary of State Colin Powell earlier said 45 nations had joined Mr Bush's "coalition of the willing" - 30 had promised concrete support whilst 15 preferred to remain unnamed at the moment. Ahead of the expected US-led bombing, which could start as early as 0100 GMT on Thursday with the expiry of Mr Bush's ultimatum, all United Nations inspectors have now left Iraq. Saddam Hussein's defiance was echoed by Iraqi Foreign Minister Naji Sabri who denounced Mr Bush's as "a war criminal" and accused Washington of trying to "push the United Nations to suicide". Washington "wanted to use the UN like an office to issue a permit to go to war," Mr Sabri said. He also criticised the UN's decision to withdraw it staff from Iraq, saying it ran contrary to the world body's responsibilities and had "paved the way for American aggression". Reporting from the Iraqi capital Baghdad, the BBC's Paul Wood says Iraqis are making final preparations for war - mainly buying food and fuel. UK Prime Minister Tony Blair makes a passionate plea for support in parliament, following the third resignation of a government member. 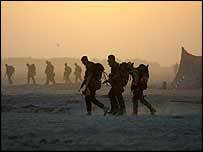 Another US ally, Spain, will not send combat troops to Iraq, Prime Minister Jose Maria Aznar tells parliament. Turkey's Cabinet meets to reconsider putting forward a parliamentary motion allowing US troops on its soil and granting US aircraft the right to use Turkish airspace to launch an attack on Iraq. More foreign diplomats leave Baghdad. Mr Bush's ultimatum has received widespread international criticism, with countries seeking a peaceful outcome to the crisis condemning Washington's decision to abandon diplomacy and questioning the legality of starting a war. In his strongest statement yet on the Iraq crisis, Pope John Paul II warned the leaders of the forces gathered against Iraq that they face a grave responsibility before God if they go to war. However, in an apparent softening of its position, France, one of the staunchest opponents of conflict, said that if Iraq uses weapons of mass destruction it may consider assisting the war effort. "If Saddam Hussein were to use chemical and biological weapons, this would change the situation completely and immediately for the French Government," France's ambassador to the US, Jean-David Levitte, said. 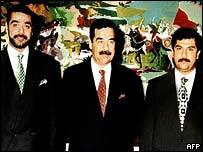 Mr Bush's ultimatum to Saddam Hussein and his two sons - Uday and Qusay - was issued during a key speech to the American people from the White House. But apparently unmoved, the Iraqi leader was shown on state television in a military uniform, chairing a joint meeting of the ruling Ba'ath Party and the decision-making body, the Revolution Command Council. "Iraq does not choose its path on the orders of a foreigner and does not choose its leaders according to decrees from Washington, London or Tel Aviv, but through the will of the great Iraqi people," the statement from the meeting said. The Iraqi leader's elder son Uday went on to call on Mr Bush "to leave power with his family". "Any aggression against Iraq will make them [the Americans] regret their tragic fate and the wives and mothers of the Americans who fight us will cry tears of blood. They should not think themselves safe anywhere in Iraq or abroad," a statement from his office said. Our correspondent in Baghdad says there is feverish speculation about what last-minute offer Saddam Hussein might make to try to avert the US-UK invasion. But with the departure of the weapons inspectors, the people of Baghdad know the waiting is almost over, he says. "Rarely has America been so isolated"